Thomas Shaughnessy scored a game-high 24 points to help Needham snag a road win at Framingham. FRAMINGHAM, Mass. - The Needham Rockets knocked off the Framingham Flyers, 61-56, in a closely contested Bay State Conference battle on Friday night in Framingham. Framingham (5-6, 3-6 BSC) was playing its second game in as many nights. The Flyers defeated Lincoln-Sudbury on Thursday night to snap a three-game losing streak. In the first quarter of their game against Needham (13-1, 11-0 BSC), the Flyers picked up where they left off on Thursday. Framingham jumped out to an 11-0 lead, with four different players accounting for the five baskets made during the Flyers’ 11-0 run. The Rockets’ offense over the first few minutes of the game was dominated by three-pointers, while Needham was not able to knock down its outside shots early in the game. With his team’s offense struggling, Needham head coach Paul Liner had to call two timeouts before the Rockets made their first bucket. Coming out of the second Needham timeout of the first period, Needham senior Matthew McKay (12 points, 3 rebounds, 1 steal) made a layup, putting the Rockets on the board with 4:19 remaining in the first quarter. A three-pointer by Framingham senior Matt Chin (5 points) and a basket by senior Aaron Jaynes (10 points, 8 rebounds) extended the Flyer lead to 18-4. Another basket by McKay and a three-pointer by Needham junior captain Thomas Shaughnessy, who led all scorers with 24 points, reduced the Rocket deficit to 18-9 at the end of the first quarter. Needham began the second period with an 11-3 run, thinning the Flyer advantage to 21-20. After a free throw by Framingham senior captain Jamie Druker (10 points) gave Framingham a 2-point edge, Needham grabbed their first lead of the game, 23-22, with 3:23 remaining in the second period, courtesy of a three-pointer by Brandon Monheimer (13 points). The score stayed within one possession for the remainder of the first quarter, with neither team leading by more than 3 points. The two teams were tied at 28 at halftime. 14 points to tie the game at halftime. Coach Liner added that Needham’s leadership and experience also helped them fight past Framingham. The contest stayed close throughout the third quarter. Senior captain Jack DiConza brought the Framingham fans to their feet with a 3-pointer with 6:40 remaining in the third period, giving the Flyers a 33-30 lead. Baskets by Monheimer and McKay gave the Rockets a 1-point advantage, but another bucket from behind by arc by DiConza allowed the Flyers to reclaim a 2-point lead. With Needham clinging to a 42-40 advantage, Shaughnessy was fouled on a desperation three-point shot attempt with .7 seconds remaining in the third period. Shaughnessy took full advantage of the opportunity, knocking down all three free throws, giving Needham a 45-40 lead going into the fourth period. 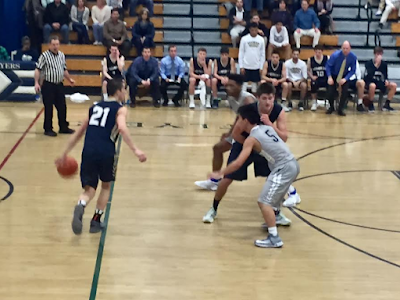 Baskets by Jaynes, senior Gio Aga (8 points), and a three-pointer by senior captain Jared Gordon-Anderson (5 points) allowed Framingham to open the fourth quarter on a 7-0 run, giving the Flyers a 47-45 advantage with 5:35 remaining. The Rockets responded with an 8-0 run of their own, which included a layup by junior Michael Klemm and a total of four free throws by Shaughnessy. Another basket by Shaughnessy gave Needham a 57-49 lead with 1:48 remaining in the fourth quarter. Framingham continued fighting back. Two free throws and a layup by Aga and an offensive rebound and putback by Jaynes trimmed the Rocket advantage to 57-55 with 32 seconds remaining. Shaughnessy hit four free throws in the final 24 seconds, helping his team seal the win and stay undefeated in conference play. Coach Liner complimented Shaughnessy on his ability to make shots down the stretch in order to put the game away. Shaughnessy added that he and his teammates try to “stay calm and stay together” when they face adversity. In the fourth quarter, Needham’s star junior led by example by knocking down a total of eight free throws over the final 4:24 of the fourth period. The Rockets showed a lot of maturity and toughness by finding a way to come back from an early double-digit deficit. Needham had to play a 32-minute game in order to come out on top against the Flyers, and Shaughnessy showed the ability to deliver under pressure and lead his team to victory. Needham will look to stay undefeated in the Bay State Conference in their upcoming game on Tuesday when they host Weymouth. Framingham will be upset that this game got away from them, but head coach Ben Torbert should be proud of his team’s effort in its second game in as many days. 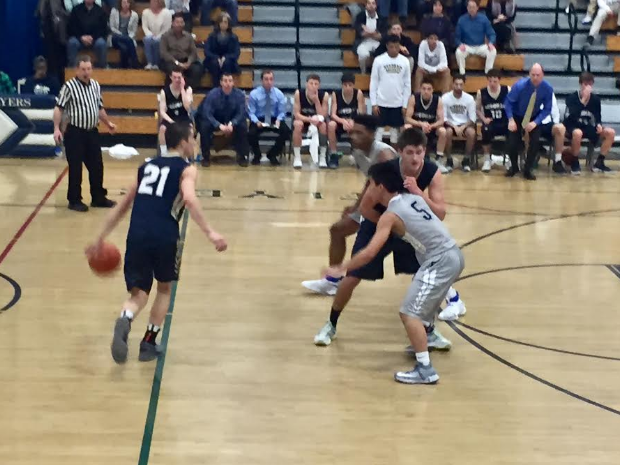 Framingham never gave up and played tough against one of the best teams in the state. The Flyers will look to return to the .500 mark on Tuesday when they host Braintree.